Faculty of Art > News > Details IUG Holds the Conference "Topical Changes in the Palestinian Cause After Oslo"
IUG Holds the Conference "Topical Changes in the Palestinian Cause After Oslo"
Organized by the Faculty of Art, the 8th academic conference "Topical Changes in the Palestinian Cause After Oslo" was held at the Islamic University. The opening session was attended by Prof. Adel Awadallah, President of IUG, Prof. Abdulkhaliq Alaf, Dean of the Faculty of Arts and President of the conference, and Prof. Jehad Alarja, Vice Dean of the Faculty of Arts and chairman of the preparatory committee. The former Tunisian president Moncef Marzouki participated in the opening session through a recorded speech. He praised the strong ties between the Palestinian and Tunisian people and talked about the support Tunisia offers to the Palestinian cause. He also commended the efforts made to hold the conference noting that it's considered part of the cultural resistance. Finally, he spoke about his participation in Freedom Flotilla III last year, which was prevented by Israel from reaching the Gaza Strip. Dr. Awadallah said that the conference is part of the university's approach in dealing with the Palestinian causes, which is based on suggesting practical solutions for the problems faced. 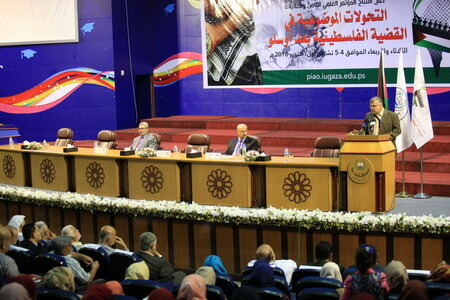 He urged the Palestinian universities to be influential factors in the society. He continued, "The conference is considered a starting point for the Palestinian ideology that leads to the Palestinian future." Dr. Alaf pointed that the Faculty of Arts, by holding the conference, was attempting to provide a scientific and systematic perspective that analyzes reality with all its aspects. This comes as 23 years have passed since Oslo agreement, which, as he noted, caused many radical changes at different levels in the Palestinian society. Dr. Alarja said that the main goal of the conference is to follow the track of the Palestinian-Israeli negotiations and reasons of stagnation. He added that the conference, with the 30 academic researches participating, aims to encourage the academic and ideological argumentation.